There’s something about a hummingbird. They are quicksilver fast, sprightly, colorful; their little rapidly-beating wings are marvels of aerodynamics. The sight of one always raises my spirits. I always used to catch glimpses of them in the backyard, but not nearly often enough. 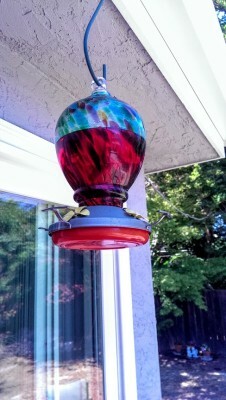 So I asked for a hummingbird feeder for my birthday, and my husband obligingly picked out a beautiful one and hung it outside the small deck in the backyard. Not once did I see a hummingbird come to the feeder. The line of red liquid stayed at the same height, never decreasing. I felt depressed, like a restaurant owner with no customers. Were we doing something wrong? Was there some stray cat lurking about the yard, scaring away potential guests? Throughout the spring, I wondered and looked wistfully at the glass globe I could see just outside the window. Then – two weeks ago – I was sitting and reading on the deck and all of a sudden I saw it: a small movement up near the feeder. I froze. A tiny bird landed on the perch. It seemed to see me, but didn’t fly off. I stayed immobile, almost afraid to breathe. It seemed so scrawny and thin, somehow, seeing it up close and not in motion. As I watched it bent its head and drank. I was thrilled, even more thrilled than I’d expected I would be. It buzzed off into the blue sky, and I watched it go. If it were human, I’d have called, “Thank you for coming! 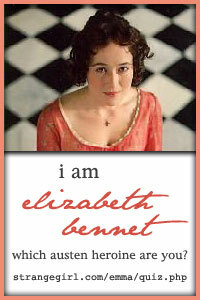 Tell all your friends!” It was astonishing how happy I felt at seeing my gift enjoyed. That close contact with the little creature was such a blessing, pure and simple. It may not have been the first bird to drink there; it’s very possible that others had been there without my seeing them. But there was such joy in being part of that moment, and in seeing the bird come confidently to the feeder, even with me sitting right there, to drink up. Maybe this is how God reacts when we stop and drink in his gifts. 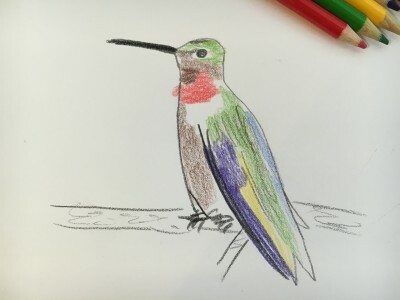 Does he feel the same kind of joy when we pause in our busy lives, when we stop flapping long enough to sit down and savor the sweetness of his creation – a summer evening, a bank of honeysuckle, a rainbow, a hummingbird? Beautiful post and a great reminder that God is all around us. I just found you this morning through your 31 Days post celebrating Igantian Spirituality. I really get a lot out of praying with imagination but have terrible discipline about daily practice. I continue to plug away connecting with God in some way everyday. There is always room for improvement! 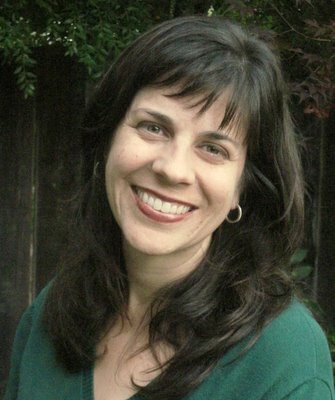 I wish I had your blog when I was a stay-at-home mom to my now 15 year-old son. Bless you for being out there for us. I’ll be looking up your books as well. Thanks again. I’ll be back offen. Have a blessed day! Thank you so much for your kind message, April! I am so happy to meet you. I too struggle with keeping a discipline of formal prayer at times, but find that Ignatian spirituality is great for cultivating a mindset of constant prayer … when you realize you can find God in all things, prayer somehow becomes a lot more instinctive. Anyhow, thanks for stopping by! Blessings on you too.